The Office for National Statistics reports that the Average (Gross, before tax) Weekly Earnings of those that choose to work in this great country of ours is rising by 0.6% per annum. David Cameron might even spin this into a demonstration that Strivers are starting to get ahead but we have plenty of more work to do if we are to lock in the recovery. Of course nothing is further from the truth as while that increase has taken place our “strivers” purchasing power has been reduced by 3.1% through inflation (RPI). This means that on the average all those “strivers” out there have actually taken a gross pay cut of 2.5%. This is not a new phenomenon. 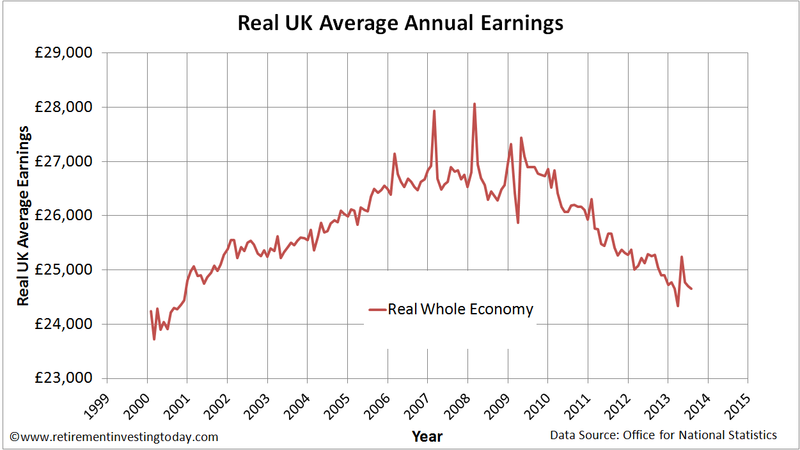 Real (post inflation)Gross Earnings have been falling for a number of years now. This can be seen in the chart below which takes the average weekly earnings, multiplies these earnings by 52 weeks to get an annual figure and then corrects for currency devaluation caused by inflation. If you’re a “striver” you’re probably thinking this all looks a little bad but it’s actually worse than this. We all know our politicians continually like to make promises they (we?) can’t afford and love to waste our money on pet follies but don’t like to tell us what that all really costs. So to hide some of the cost they use that inflation to their advantage by combining it with our Progressive Tax system and Fiscal Drag to tax us more without having to even tell us. Let’s demonstrate with an example. Our average “striver” was earning a gross £471 per week and was then given that 0.6% annual increase taking his earnings to £474 per week. Using a PAYE Tax Calculator we can see our “striver” has seen his net (after tax and national insurance) earnings rise from £374.47 to £376.51. So as far as the “striver” is concerned it’s not an increase of 0.6% at all but actually 0.5%. After correcting for inflation the pay cut is then actually 2.6%. If our “striver” just accepts this instead of finding ways to earn more or spend less then every day that passes results in him becoming poorer. Note that when I say poorer I’m not meaning he can’t now buy an iPad when he could previously, but instead I’m meaning he is able to save less for his financial future. It’s also important to say that I’m not for a minute suggesting that our average “striver” is now poor. Given the waste that goes on in this country plus the standard of living that the vast majority of the rest of the world enjoys there is no way you could say he is even close to poor. On this site we cover numerous ways to earn more and spend less. 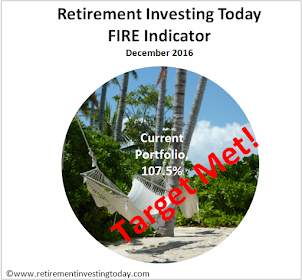 The difference of which is the Saving Hard portion available to help increase your wealth. Some have a big effect but we mustn't lose sight of the small things that can help either. The reason for this is that small things become big things over time. Which brings me to the nub of this post. Could our “striver” use a credit card to help recover the Save Hard portion that has now been lost? Firstly, I’ll say that if you use a credit card like most people in modern society do then you most definitely won’t. Those people end up with instant gratification and a whole pile of debt to go with it which is the opposite of what this website is all about. Do credit cards control you (ie you’re paying interest monthly or do you control them (ie you get cashback and/or free bank interest while paying no interest)? As always I’d value your thoughts. That's more or less what I do. 1% CB for all my purchases and each day I transfer from my bank to my CC. Eg £65 on Petrol and £47.23 on groceries onto 1% CC. During my tea break at work I fire up my online bank and do to transfers from my bank to the CC. (One each of £65 and £47.23). Job done. I could of course do one for £112.23, but I find it easier to do a 1-1 payment. "transfers from my bank to the CC": why not just pay off the card by Direct Debit and that way you can earn interest on the money until it's debited? Thinking through your suggestion with my expense profile I hit the problem that not many of my current significant expenses could be paid with a credit card, but if that changed maybe it's a go'er. Meanwhile I might put pencil to envelope and see if a cashback current account will fly for me. Interesting that you mention iPads because technology is one area of expense that is actually getting cheaper. People who buy mainly food and fuel are seeing even higher rates of inflation than the headline averages that you quote. Regarding cashback credit cards, for me this is is both not worth the effort and quite risky. Not worth the effort because there are plenty of better ways of generating a bit of extra money instead of mucking about on the internet opening accounts and transferring money around. Risky for all sorts of unpredictable reasons. When I used to relentless pursue the best deals on financial products I ended up with an Icesave ISA which was then frozen when they went bust. Worse, because I'd changed my current account to the latest best deal I had to wait an extra few months to access my money because I no longer had the same 'nominated account' for withdrawals. Credit card pushers rely on otherwise reliable people forgetting to pay their bills on time or otherwise getting into difficulties. It can happen, for all kinds of unforeseeable reasons. I'm with BTS on this. I don't spend enough on credit cards for this to be worth the faff. I used to do it, when I was spending more while working and when you could actually turn a useful return on cash. I can't be bothered now, even as a retiree with more time to myself life is too short to chase this kind of return. I'd imagine you get a greater ROI on your time and effort via your insightful researches on how to improve investing and digging for the surprising facts than you get running a measly 1 or 2% interest on the cash you don't have to pay the CC company. Now when interest rates return to something live 5 or 6% this may of course become a different story! coincidentally my Barclaycard statement arrived today. An annual refund of £2.45. I only use it for internet purchases and I also have a cashback card with Nationwide which is my main card. But it isn't going to hasten my arrival at FI. still every penny helps I suppose. I have made many financial mistakes in my life, but I never ran up a debt on a credit card (smug!). We too use our credit card for most cash purchases, then pay the full balance off each month. As it's a John Lewis card we even get points, that turn into JL vouchers. Okay, the JL group ain't the cheapest stores around but it suits us. Hi RIT -- Just a quick note to point out one of your "strivers" in the first paragraph is missing a T. A little thing I know, but it jumps out because it's the subject of the post. If your current credit card company does not give you cashback then sometimes if you threaten to leave they will offer you a bonus to stay for a while e.g. cashback (my preferred option) or long term zero interest (potentially very dangerous). So, if you have a credit card that you have had for many years but hardly ever use it and could live without it, give them a call to close the account. The worst that can happen is that you no longer have a potential security risk sitting in your wallet should it be stolen. The downside is that the call might take a few minutes. I do this with an Amex and a Mastercard as I still find some places will not take Amex. I pay off the balance in full automatically with Direct Debt, so I know I will never do into debt and I will only ever spend an amount that I know I can clear in full that month. Paying for shopping and fuel this was is usually the right thing to do. However, I'd add another caution. Spending on a credit card is not like spending cash. When you had over paper banknotes it is "real" money. When you hand over a credit card or use it online you are abstracted from the money itself. This means there is a little less resistance to spending it and some may be tempted to buy things they otherwise would not if forced to pay for everything in cash. I am proud to say that I control the credit card. With a direct debit to pay it off in full each month, I have only ever financially benefited from holding a credit card by earning reward points. I would recommend it for all, strivers alike! This is all very well, and I've been using a monthly-repaid-in-full, cashback credit card ever since the Egg card (1% clean) appeared. However, I'm not sure that it really helps. Credit cards make spending easier, and that's the downfall. It's even worse when I justfy a purchase to myself with "... and I'm getting a 1% discount due to the cashback!". 1% cashback, and 99% extra, wasteful expenditure. I'm thinking about giving up the £60-£100 cashback I make year after year, by switching to cash spending. That's the ultimate hard budgeting tool for face-to-face transactions. The savings-account interest on the credit card's balance is peanuts too -- it's going to be a small percentage of the average card balance. My partner and I have both used cashback credit cards paid off at month end by direct debit since the Egg card first became available. 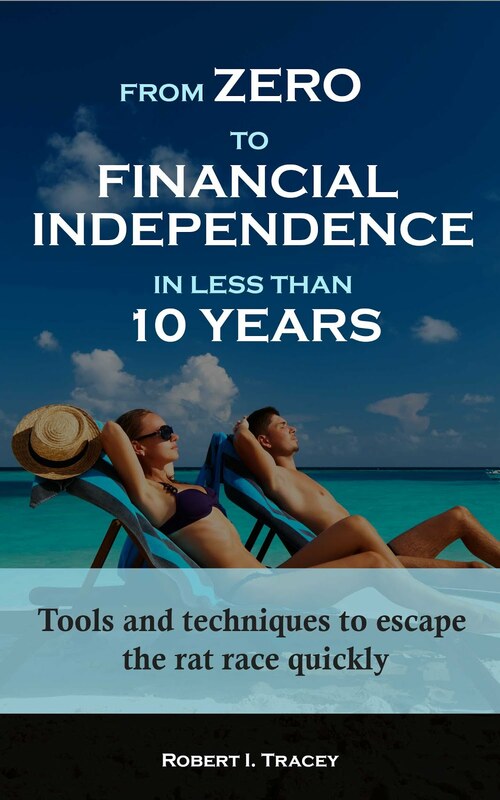 We get £150 per year or so from it; it requires no thought or effort and it beats the hell out of chasing high-interest accounts for an extra 0.1% or trying to reduce charges on investments by 0.1% unless you have very large sums to play with. I also use cashback websites and get around £100 per year. If I were not retired, I wouldn't bother with it because of the time and effort it takes. Both ruses are of course far more effective money savers than reusing teabags et alia and I get to drink decent tea to boot. ( Loose leaf Darjeeling, single estate if I can lay my hands on it!). Never forget that there is more to life than penny-pinching - a point brought home by the recent deaths of several friends. If Anonymous is getting his/her £150 from the same Egg card as Unknown then that's £15,000 of credit card spending in a year. Unless they've managed to pay for council tax, water and utilities on the card then that's a lot of discretionary spending!